Square Marketing allows you to set up automated campaigns. These are emails sent to customers on an ongoing basis following a one-time setup. They’re only sent to customers that meet the specific criteria for each type of campaign. The emails will continue to be sent until the campaign is turned off. Welcome: This email is sent to new customers within 24 hours of their first purchase, and encourages them come back again. Winback: This email is sent to lapsed customers. Your lapsed customers are those who’ve made 3 purchases within a 6-month period, but haven’t returned in the last 6 weeks. This message is meant to bring them back. Birthday Offer: This email automatically sends an email to each customer 7 days before their birthday. By default it includes a coupon to encourage customers to visit, but you have the option of removing this. Birthday Collector: If you’re missing birthdays for some of your customers, this campaign will help you collect them. This email will ask up to 500 customers per day if they want to share their birthday with you, and it will add their birthdays to your Customer Directory when customers opt-in. Reputation: This campaign automatically sends an email asking customers to leave you a review on your Facebook page. It goes to any customers who are regulars at your business or have left you feedback through Square receipts. Note: To view or change the definition of a regular from your Customer Directory., select the regulars group under All Customers and select Edit Group to make an update. Follow-up / reminder emails can be enabled from the Audience & Send step when creating an automated campaign. If the original email is not opened, the same email will be re-sent 5 days after the delivery date of the initial email. Additionally, if there is a coupon / discount included in the campaign, a reminder will be sent 7 days before the coupon expires. Visit Marketing in your online Square Dashboard. Select Welcome new customers > click Continue. Customize the email and offer > click Activate. Select Bring back your lapsed customers > click Continue. Select Wish your customers a happy birthday > click Continue. Customize the email and offer. Select Ask for your customer’s birthday > click Continue. Customize the email > click Activate. When you’re collecting your customers’ birthdays, activate your Birthday Offer campaign to start sending automatic birthday emails with rewards. Note: Once activated, Automated Campaigns must be cancelled to prevent further emails from being sent. Once they have been activated, Automated Campaigns must be cancelled to prevent further emails from being sent. Visit your marketing campaign in your online Square Dashboard. Click on the title of the campaign you’d like to cancel. Click on the … and select Cancel. If a coupon is part of the campaign, decide whether you want to continue to honor coupons that customers bring in . Click Cancel Campaign to confirm. You can view the ongoing results of your automated campaigns . 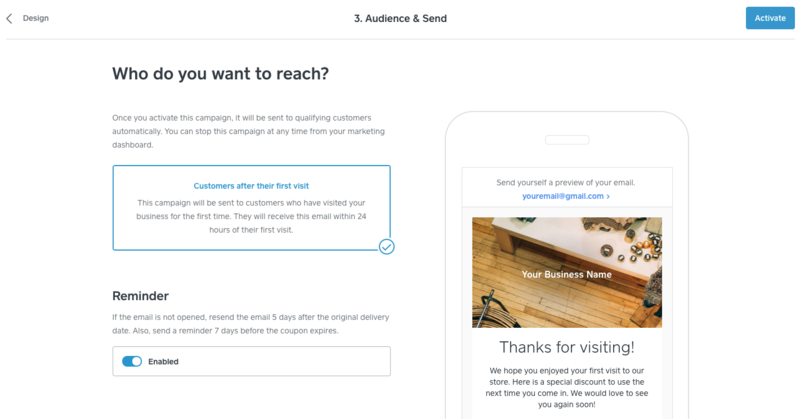 You’ll be able to see how many customers received your campaign, as well as open rates, coupon redemptions, and attributable sales for each campaign. Select the campaign > click View Report, or click on the campaign name. If your business has multiple locations, you can only create automated campaigns that work across all of your locations at this time. Your customers will qualify for different campaigns based on their engagement across all of your business locations, but will only receive one Welcome email, one Birthday offer each year, etc.